Beautiful day in Seattle called for a quick flight into the mountains. Baker stood out in the sunshine, so I had to get a closer look. Watch the video, and make sure to set the Settings for 1080 HD. Definitely one of the many reasons why I built this plane. Unusual fall weather in Seattle leads to the clouds parting and completely clear weather for about a week now. Bekah and I took advantage with some friends to cross the mountains over to Eastern Washington. Our destination was Desert Aire on the Columbia river for a quick lunch. It was a great trip and we met up with a couple friends in the air, one of which we had never met and he was from the east side of the mountains. The weather was clear and beautiful, so we had an amazing time. Its considerably rare to be able to get over the mountains in November like this and we wanted to take advantage, and luckily we were able to fly formation and have a few really nice pics taken of us over Snoqualmie Pass. The summer of 2014 has been quite a summer full of flying. The last big trip of the year was down to Reno for the National Air Races. On this trip, I took a friend from work who had an in on some great box seats. After watching weather all week and ending up with a great Friday morning, we opted for a 7:00 am departure. I found out another VAF Friend was flying down from Puyallup on same day same time, so we coordinated flight paths. He got off the ground before we did so was always about 40 miles ahead of us. We were able to reach out and talk on air to air frequency the entire way. That worked out great for us because he could provide visibility reports ahead which due to the amount of Forest Fire Smoke in the air around Crater Lake helped put our flight at ease. Smoke is a different animal than clouds because it doesn’t have any visible boundary. Flying into it, you can easily lose all visibility without even seeing it coming. Luckily on the trip down we were able to stay on top of it for the most part, and still have enough visibility to see the ground directly below us. Crater lake wasn’t very visible though which definitely was a bummer. We made it to Reno in 3.5 hours with almost neutral winds. Getting the rental car from the FBO and opting to skip the hotel check in till later, we were able to make it to the races by early afternoon hardly missing any of the Friday show. I knew we had good Box Seats, but had no idea just how good they were or the history that came with them until we arrived. It was shocking when we walked into the grounds and walked right up to show center and into the first row Box. The owner of our box had been going to the races for over 29 years and has had this box for much of that time. He named it the S.O.B. Box, which of course stands for “Steersman’s Owners Box” and has a very recognizable banner on the box. It truly was one of the best 2 or 3 boxes at the Races which made for an amazing show. Also the box had a very dramatic history which effected all the people who had been going to the races and historically sharing that box. You may have heard of the Galloping Ghost accident in 2011? The most tragic accident at the races in history where the plane impacted in the box seat area killing several attendees. Well that plane hit about 20 feet from the box, but the direction of the blast fortunately reflected away from the box to spare all the lives of the members in that box. In fact, all neighboring boxes suffered deaths in the horrific incident. I could feel the connection that all the S.O.B. members and neighboring boxes held based on that tragic event. Also, it was eerie as so many people in the neighboring boxes had prosthetics in place due to the loss of limbs etc. that happened in that accident. It seems that these Air Race Fans are so dedicated to aviation and their losses from that day have somehow made them an even more dedicated and greater part of the air races and they continue to come year after year even post-accident. We had Pit Passes too, which allowed us to go mingle with the teams and learn more about each aircraft. I think I am team Rare Bear.. Such a beautiful plane ! The final Ultimate Gold heat was great, although there were 3 mayday calls I think. All landed safely but in the end it made for an interesting heat. Rare Bear was one of the mayday calls, and of course Strega was out from the day prior, so a few of the big hitters didn’t even finish or compete in the last heat. In the end it was Voodoo in First, followed by Czech Mate, with Precious Metal in 3rd. Fourth was Dreadknot and due to a contested line break from Precious Metal, I think Dreadnaught ended up taking third in the end. Quite an interesting end to the Air Races this year. Our trip home went as planned as well, except for even more smoke in the air all the way from Reno to Seattle. Basically is seems the entire west coast is burning right now. 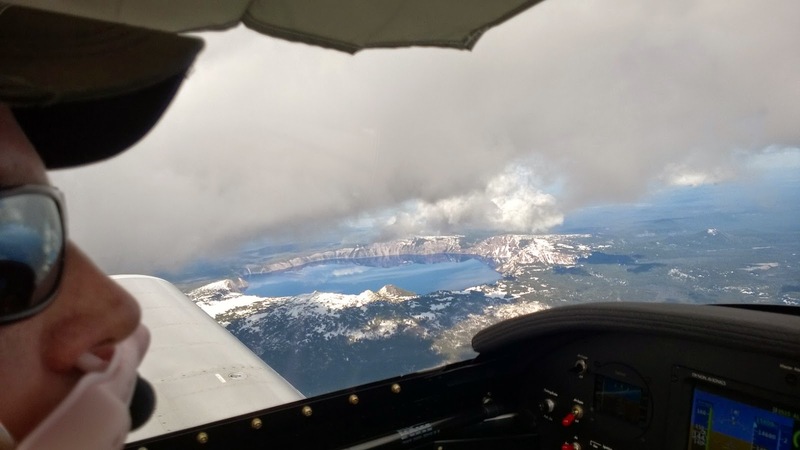 The only bonus was that Crater Lake was slightly more visible this time through and I got some photos of the lake with a friend whom we flew home with posing in his RV-7A. We have done a ton of flying this summer, but still have a couple more items on the list that we really wanted to hit. Johnson Creek was one of them. Johnson Creek is kind of a legend airport in the RV world that you really have to go to at least once in your life. It is a very mountainous place and there is a recommended approach procedure to follow located “ here” that is designed to provide as much safety as possible. I read the procedure back and forth, also watched a ton of videos that others have made to get as familiar as possible. You definitely need to know your airplane and have some mountain flying experience before going in to Johnson Creek. 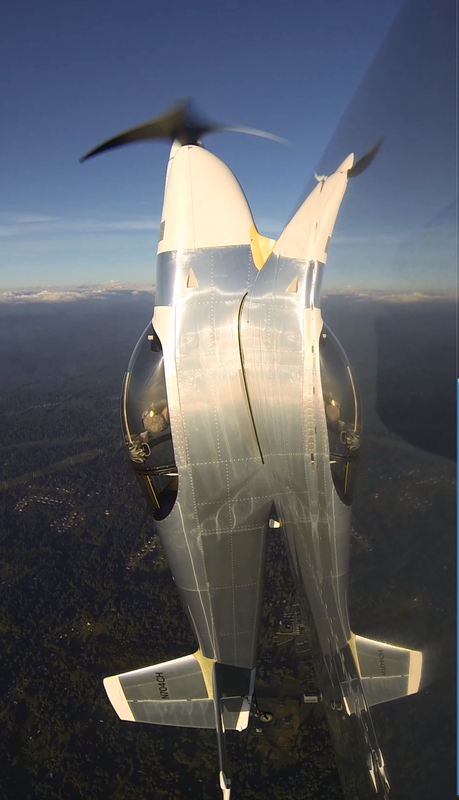 I had a Go Pro on the wing that actually captured a pretty amazing video that you can see below. For this trip, we made plans with a friend who has an RV up at Arlington to meet up Friday at 4:00 in the air above Snohomish. From there we flew together in a 10 knot headwind the whole way to Johnson Creek getting there about in about 2.5 hours. As you can see in the video, it put our arrival right in the early evening which made for some great shadows in the canyon. Bekah and I were shocked to see how serious this canyon is. The canyon walls are much steeper and much closer in that even the video suggests. It’s a wide angle camera lens so while it captures everything, in reality those walls and trees are much more daunting than even visible in the video. After arriving we quickly set up camp and made a huge fire with the free firewood as the temps plummeted. Overnight it got down into the 20’s, but then the next day as the sun came up over the canyon walls the temps shot up hitting about 80 degrees on our hike to the famous hot springs bath tub.. Here I am getting in my morning bath ;-) While Bekah, Scott and Casey get the famous foot soak. Such a great trip and just amazing that we are lucky enough to do things like this. The Flight home was fairly bumpy as we departed mid-day in the high density altitude, and continued as we came across the Idaho mountains into Washington. 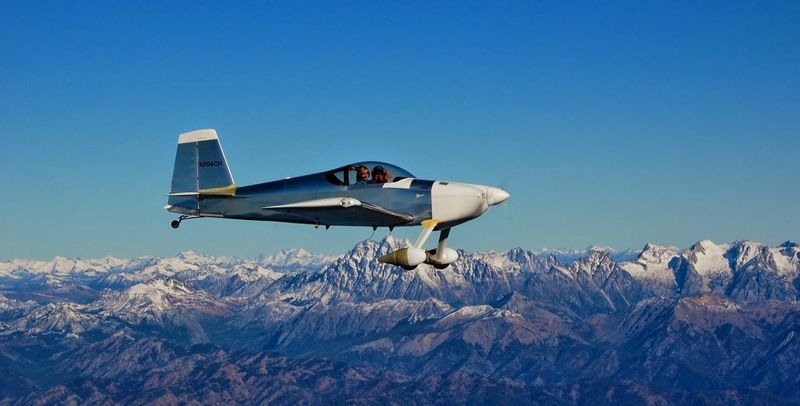 We refueled near Walla Walla and then shot across the Cascades in much smoother air making it home by late afternoon. Amazing trip ! Oshkosh is a huge aviation expo that goes on at the end of July each year in Oshkosh, WI. This year it worked out well because there was a 50th year anniversary party in Casper WY for friends of the family. Casper is about ½ way to Oshkosh, so I spent a few nights there for the party, then flew onto Airventure. I put about 3300 miles under my wing for this trip and about 19 hours on the airplane. It was a crazy packed week but was really fun. Bekah and Ariel went with me to Casper, but because they don’t allow dogs at Oshkosh, she stayed with my parents and ended up in Cody near our ranch just outside of Yellowstone park. I spent a couple nights at KOSH and then flew back to meet her in Cody and spend a couple nights there as well. Then we finally headed home and were back in Seattle 5 hours after departing Cody. Crazy efficient and wonderful machine. The scenery east of WY is not very pretty since it is just so flat! But here are a few pics on the way back over the South/East end of Montana and Wyoming of Devil’s Tower and Yellow Tail reservoir. Both very pretty sites to see from the airplane. Also, on the way out of Seattle I had a huge tailwind so I just had to take a picture of my Skyview Display. Shows 209 knots groundspeed, which is about 241 miles per hour while burning 7.2 gallons per hour. Crazy Airplane ! 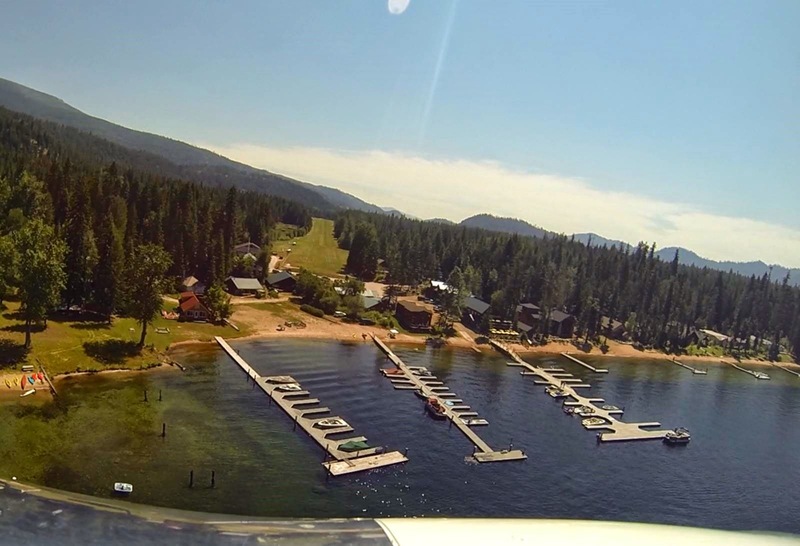 Cavanaugh Bay on Priest Lake Idaho is unique in that there is a great grass strip right next to the resort. Idaho loves its airports and it shows, this strip is so well maintained and welcoming for pilots. Free Camping with Showers, Firewood, Refrigerator, Coffee and the caretaker was just an all-around great guy. Also, running into like-minded aviation campers topped it all off. We left Seattle about noon on Saturday and put all of Washington state under our wing landing in Idaho by 1:30 at Cavanaugh bay. It is so great to leave one environment, and then be transformed into a completely different environment such a short time later. There were some bumps around Grand Coulee, but that is to be expected midafternoon over eastern WA. We set up camp and headed to grab a beer at Cavanaugh’s. Ariel had a great time and took her first swim in the 90 degree weather. We did need to get our food to go since they don’t let dogs on the deck, but it was just as good to eat the gourmet dinner by the fire as anywhere else. Then the next morning we had the brunch before shooting back across the state after a quick stop in Sandpoint, ID and getting home before 1:00. Overall a great weekend. 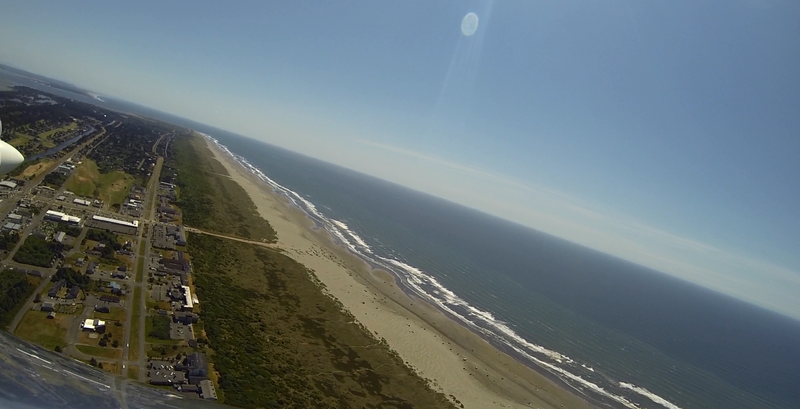 Flying to the coast was something we always wanted to do, typically winds are a bit stronger out there and we really wanted to hit up Ocean Shores. Ocean Shores is kind of unique in that the runway always has crosswinds. Usually runways are built the same direction as prevailing winds in the area, but here I think the runway was built the only direction the land would allow, which results in constant crosswinds. That combined with higher winds of the coast we were always cautious about heading out there. Saturday the morning winds were forecasted to be light so we went for it. Turned out to be fine and we landed before the winds picked up. Took the 30 minute walk into town and hit the beach as well as a local fish and chips place. The winds did pick up and it wasn’t very warm, so the overall experienced suffered a bit due to that, but in general we had a good time. On departure we took off in a crazy 15 knot crosswind and flew up the beach and checked out Copalis Beach Airport which is an airport where you can actually land on the beach. Will have to fly in there eventually as well. After work today I ran up to Paine Field and took a quick 40 minute flight to work on some aerobatics. I am still pretty much an aerobatic rookie, but I did put together a video of my training flight. I usually keep my videos under 5 minutes but this one stretches a bit out to 10. Sorry about that, watch it when you have a few extra minutes. The silver aluminum is beautiful against the Washington sky and landscape. It was a very cool flight. CLICK the below link for the Video ! ! CLICK the above link for the Video ! ! On the way home from Phoenix in route to Salt Lake, we flew the “Dragon Corridor” over the Grand Canyon. This corridor is the eastern side of the canyon which allows for a full view up the canyon from the left side of the plane. We had the GoPro on the right, but it was still able to capture much of the canyon. Also took some SLR shots of the canyon which are posted below. This type of event flying over the Grand Canyon in the airplane that you built is really a life achievement. It was quite awesome ! After seeing the Canyon, we flew the rest of the 1200 mile distance in one day and were home in Seattle by 5:00. What a machine !